Retirees don’t need deep pockets to retire on the beach, according to a new report from the editors of InternationalLiving.com. In the world’s best-value coastal escapes, a budget of as little as $2,000 a month can fund a couple’s comfortable retirement in the sun, complete with sailing, surfing, fishing, diving, and cocktails on the sand. “Most folks put a retirement at the beach in the realm of fantasy. Having a place on the ocean, soaking in the sun, spending laidback days with toes in the sand, fishing, diving, sailing, surfing, walking on the beach at dusk with a cocktail in hand...that’s a ‘rich man’s retirement,’ in most people’s assessment,” says IL Executive Editor Jennifer Stevens. A new report from the editors of International Living points to a series of beach-town gems in Latin America, Europe, and Southeast Asia where retirees can “live large” on a modest budget. These towns are all located within countries that appear on International Living’s Annual Global Retirement Index 2018—Costa Rica, Panama, Ecuador, Malaysia, and Portugal among them—which offer safe, welcoming, and picturesque beach towns in which expat retirees report that they are enjoying fun, healthy, fulfilling lifestyles on a modest budget. There’s a saying in Costa Rica: Pura Vida. It basically means “Life is Good.” People are content and happy. It’s an attitude and a way of life. And this year, for the first time, Costa Rica takes the top spot in InternationalLiving.com’s 2018 Global Retirement Index. The Pacific-coast beach town of Tamarindo is a place of natural abundance, offering fresh produce and seafood, clean air, and more than two miles of golden sand. Tamarindo is situated within one of the world’s “Blue Zones”—areas where people regularly reach the age of 100 in good health. And, expats report, it’s a surf town that values fitness and embraces an outdoorsy culture. The couple lives in a fifth-floor condo, on a hill that overlooks the beach town as well as the forest along the gold-sand beach and out over the deep blue of the Pacific. “It’s a real joy to wake up and come out here and realize what we’ve done,” says Pokey. Tamarindo is accessible for a couple on $2,500 a month (housing included), and in addition, Costa Rica offers high-quality but low-cost medical care, good-value real estate, established expat communities, and welcoming locals. Pedasí, a four-hour trip from Panama City, sits on the tip of the Azuero Peninsula, providing a relaxed setting for expats like Jim Gault and his wife, Abbe. “Our lives here are a far cry from the hectic existence we lived back in Florida,” says Jim. This is the life they have created for themselves in the small town on Panama’s Pacific coast. Unspoiled, dark brown beaches are coupled with often stunning rock formations and warm Pacific waters. Large cattle ranches and corn fields surround the village. “In many ways, it reminds me of small-town America 50 years ago. Everyone here is so friendly. Walking home in the dark after a nice meal often means walking by a group of teenagers. On a dark street in a U.S. city, that might be scary. Not so in Pedasí. The teens just greet you with buenas noches (good evening). The cost of living in Pedasí is another big plus. The Gaults own their own home and vehicle and Jim says, “I’m collecting my Social Security and we live comfortably on $2,000 a month, including several trips within Panama and one trip abroad per year. Daily costs in Salinas are low. Retirees who move to the relatively small Ecuadorian town, see a huge plummet in expenses with couples living a comfortably on $1,405 per month. “We knew that we would spend less money, as well,” says Jim. “We traded property taxes of $5,000 a year for a tax bill of $279. Our condo maintenance fees in Maryland were $1,000 a month; in Salinas, just $197. Only two degrees south of the equator, Salinas is a great place for those who want to escape the long, cold North American and Canadian winters. The sunny season goes from mid-December through April. The warmest waters are between January and March making it a perfect beach destination for an active lifestyle. When the Santos’ first started to think about moving overseas in 2012, Jim was morbidly obese, weighing 319 pounds at one stage. He took two different medications a day for Type II diabetes, and one for high blood pressure. “Moving to Ecuador changed everything. After a few months, I’d lost 25 pounds. By the end of the first year, I was down another 10 pounds, and I had to reduce the dosages on my diabetes medications to prevents sugar lows. One of the oldest outposts of the former British Empire, Penang delivers 110 square miles of tropical treasures. It offers a perfect balance of nature and sophisticated amenities that make it a wonderful haven for expats. It boasts lush jungle-covered hills bursting with wildlife, as well as fancy modern high-rises and pristine beaches. Attracted by the relaxed lifestyle and enticing low living costs, retirees from across the globe have settled here. And almost everyone speaks English, so communicating is easy. In 2010, Larry John from British Columbia, Canada, paid $142,000 for his three-bedroom, two-bathroom condo with a sea view in Penang. It’s off a tree-lined street in a well-kept, gated development, with a top-of-the-line gym and swimming pool. “In Canada, to find something similar to what I have now, with an Olympic-size swimming pool, wading pool, Jacuzzi pool, tennis court (which can be used year-round), gym, games room, and conference and meeting rooms, would cost at least 50% more, with much higher condo fees and property taxes,” he says. Larry’s budget—and he’s living well on it—is less than $1,600 a month, now that he owns his own home. “It’s great for those on a fixed income or self-financing their retirement,” he says. Rated the third-safest country in the world in the 2017 Global Peace Index, Portugal is not only secure, but beautiful. 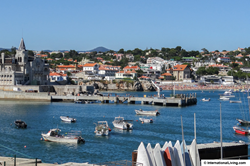 Cascais is a beach haven about 20 minutes from the capital, Lisbon. With its boutique-lined streets and many art vendors and vintage carousels, this town is like something out of a storybook. Yet its sunny shores, friendly inhabitants, and modest prices are no fantasy. In summer, the average daytime high here is 73 degrees with low of 63. And in the winter, it’s almost always about 50 degrees. You can golf nearby, and favorable wind conditions make the stretch of coast along here ideal for sailing, surfing, kite-surfing, and windsurfing, too. Plus English is widely spoken. Here you can rent a condo from about $750 month. A light-filled two-bedroom place with a sea view—fully renovated and furnished—right near all the conveniences you could need and a 10-minute walk to the train station rents for $1,114. This beach town is one of Europe’s best-kept secrets...and on $2,500 a month, a couple could live very comfortably here. Editor's Note: Members of the media have permission to republish the article linked above once credit is given to InternationalLiving.com.